Everything you wanted to know... or maybe not... about Purplefire. Purplefire on the Risembool Rangers and Tomgeeks forums. Alison has been drawing and doodling since she has been holding a pencil. 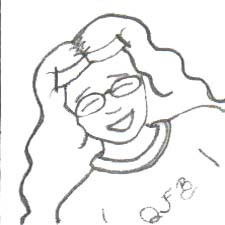 Her favorite things to draw as a child were the characters from her favorite TV shows and movies. Her mother saw her daughter's interest and bought several how-to-draw books, which Alison devoured in her hunger to learn more about art. In 2001, she obtained her Bachelor of Arts degree in Art. Her first adventure in putting up her drawings on the Internet was by posting her pictures up on a blog. When will Remnants start? At this time it is undetermined. I am still working on story and concept. Once I have good direction and about 10 pages of buffer, we will start Remnants. Why did you start QFB? Really, this project started out as a gag on another website. I used to frequent a forum with my brother (the real Blueentity) and when Blue left the website, a lot of the other users kept asking where he was. That prompted me to write a humorous short story of why Blue was not coming to the web site anymore, and the story used the names of the other users on the site. The story was well received by friends and family alike, which led to my sister-in-law (the real Pinkentity) to ask, �When are you making this into a webcomic?� Those words, spoken lightly at the time, would change my life. Colors? Why does everyone have a color for a name? These were the user names that my family and friends had from the above mentioned website. A lot of the names in the webcomic such as all of the Mosaic, Tarhia, Argoyle, Kleptin, Indigo, BitBit and Exotica are people I knew and hung out with on that forum. This isn�t the story I remember reading on the other forum! Yeah, I changed the story around a bit, both to make the story stronger and to make the characters more my own. I guess you�ll have to wait and see what happens next, eh? You forgot to add (insert random accessory, equipment, scar, etc.) on (insert random character) on (insert random page)!!! Aw snap, did I? *blushes* Continuity is harder than it looks. Why did you suddenly start to color the comic at Chapter 5? Why not have the entire comic in color? To be honest, when I started QFB, I had no idea how to consistently color pages. Heck, I still have no idea how to consistently color pages. I�m still learning how to color and shade so bear with me please as I bumble along. How long does it take to complete a page? Anywhere from three to six hours, depending on how distracted I am. Oh look! Something shiny!